Singapore...prude or liberal? You decide! 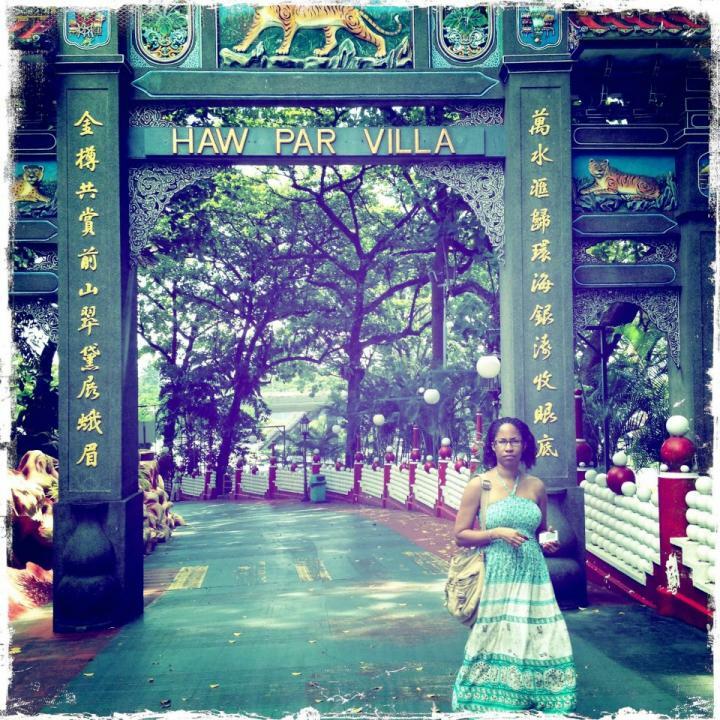 - Blog from Singapore, Singapore | Where in the world is Celia? Singapore...prude or liberal? You decide! I've come to the end of my Singapore trip. It has been such a fantastic experience that I'm so glad I surpressed my fears and embarked on this trip. Singapore is a beautiful cosmopolitan city. It gives me the impression of someone having the sky as the limit in it's design and layout. Here's a little background on Singapore. It is an island country in south east asia, separated from Malaysia by the straits of Johor. It was occupied by Britain, then Japan and later got it's indepedence as a part of Malaysia in 1963. It later separated from Malaysia in 1965. It is constantly growing and increasing in wealth and is the worlds 4th leading financial center. This is evident in the numerous upscale malls, FILLED with patrons, towns and parks that seemed to spare no expense in its designs. There is the floating Louis Vitton store in the Singapore River. Additionally it also boasts having one of the largest and the world's most expensive casino having 3 towers with a huge island village with the world's largest infinity pool built on the top of the 3 towers. I'm told that every evening there is an extensive light show performed over the bay. I did happen to see the light show while bike riding along the bay one evening and incorrectly thought it was just that evening that the light show took place. I visited 4 ethnic towns; chinatown, japantown, arabtown and indiatown. Chinatown is similar to chinatown in New York City with the many stalls with venders of trinkets and scarves. Although one big difference between chinatown in New York City and Singapore is that the goods in Singapore are not that cheap. My first stop was the Buddha Relic Tooth temple with a stop at the visitor center across the street from the temple. I was told I could sample some foods at the chinatown complex on smith street in their food court. There is also what they call a wet market there. The place just seemed a hodge podge of stalls just thrown together and nothing about the layout stirred up an appetite to try anything, aside for a cup of cane juice. Delicious! I felt so tall walking around that neighborhood and also fat. I went to a clothing stall and the lady told me I needed extra large for a dress I was interested in purchasing. I looked at the dress (I was forbidden to try it on) and had doubts that even the extra large would fit my West Indian curves. Finally when I saw a sign directing me to "more shops inside toilets", I decided it was time to leave the complex. I did find some nice trinkets and souvenirs for friends at chinatown. Japantown is the neighhood I called home for 10 days. It is a more afluent bustling neighborhood with many nice Japanese restaurants and also restaurants from other nationalities. It is along the Singapore river and things are expensive at the local supermarket. I saw a cantalope for $39 Singaporean, a slab of beef brisket for $1000 SIN. In fact, due to the expense of things, food is packaged in small quantities. Thus, it is possible to buy 6 slices of bread or packages with just one clam or 3 scallops. It is near Clarke Quay a pedestrian area with restaurants and clubs. There are huge umbrellas over the whole area so as not to hinder the bar hopping process during sudden heavy rainfalls, common during the rainy seasons(December - March and June - September) in Singapore. It is always filled with people especially in the evenings and late into the night. Arab town was unremarkable. However I'm told it livens up late in the evening and I was there in the afternoon. There is a mosque that I was unable to enter since I was told it was closed. However, I saw people entering the mosque as I walked away. For those lover of quaint boutiques, Haji Lane is the place to go. I must warn that you'll need to bring a big bank account to take full advantage. There are also many restaurants to choose from. I ended up eating outside under the stars at Deli Moroccan restaurant. I enjoyed my grilled lamb kebabs. Indiatown is my most favorite of all the ethnic towns. The buildings are so colorful and completely different from any of the other towns I'd been in. As I got off the bus, I felt like I had been transported to New Delhi. It is a bustling town, filled with venders of yellow gold and beautiful Indian dresses, scarves and other trinkets. I went during Diwali(a hindu festival also known as festival of the lights), so the streets were adorned with colorful banners that I was unable to really capture its beauty on camara. There is an uneven distribution of men and women here as well as other parts of Singapore. Restaurants were filled with men, many times I was the only woman in the restaurant. It was explained to me, that many day laborers came to Singapore from India. They are mostly men that have come to work at the construction sites, constant and frequent in Singapore. I was so fearful of breaking one of Singapore's many stringent laws and getting fined or flogged. But as it turns out, while the laws are on the books, the people to enforce them are not - the police. In my entire trip, I saw only 1 policeman. I do find it ironic, that one could be fined for not flushing a public toilet, yet prostitution is legal. In fact one block up and parallel to a major tourist street and adjacent to the business district was a street filled with w****house after w****house. There were women sitting at tables willing to stroke your ego with words for $40SIN and higher prices for other strokes. It's definitely a man's world in Singapore to allow such practices legally. Finally there is Santosa island, a place people dream about in their minds but is a reality for Singaporeans. It reminds me of a Disney theme park, with it's perfectly curved beaches, beach houses with pretty people playing volleyball in designer swimwear, rope bridge to perfectly designed beaches, fake surfing areas, luge, zipline, flying encounter and much more. It was so perfectly pretty and lush. 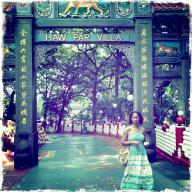 As usual, the singporeans did not seem that enthused about this enchanted place. It costs about $6SIN to enter the island and then one can take the internal shuttle buses from one part of the island to the next. Turns out most of the perfection is manmade as I examined a beautiful large stone to discover that it was not real. It boggles my mind that there would be need to replicate what is natural on this beautiful tropical island nation. These were my thoughts of Garden by the Bay as well. I went bike riding through the gardens (this is not allowed, but I did it anyway.) and saw beautiful tropical gardens with native fauna created in the way the designer wanted to present it. And I thought, why have they dug up a place that is naturally pretty, to put the same thing that has no other purpose but for people to wander through the gardens and gaze? There is not much of the original Singapore left. Developers are constantly knocking down old buildings and replacing them with westernized buildings. So if you're going to Singapore execting to see an ancient unique asian culture, you will be disappointed. Being in Singapore was no different from being in the USA, London or any other Western major city.